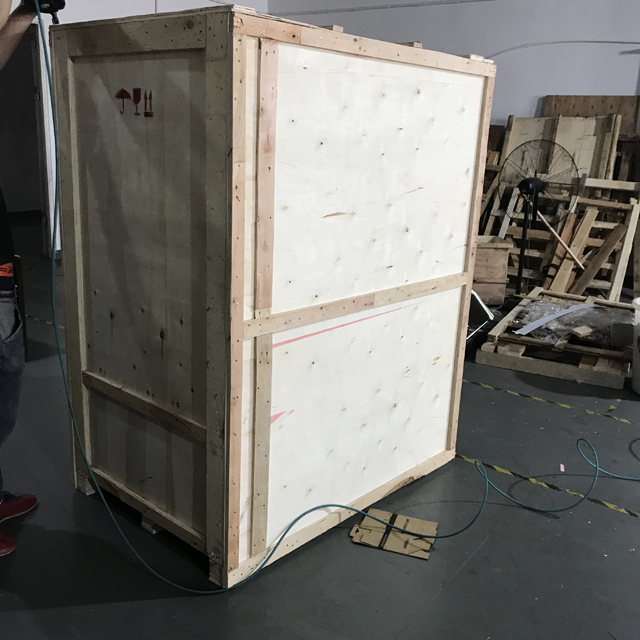 Roll of film diameter:280mm or less; Inner dia:3"
The irregular-shaped bag packaging liquid is specially designed for our customer who only offered us the size of film. 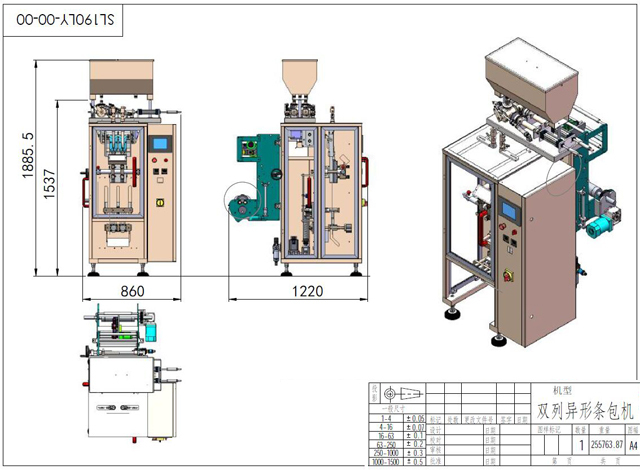 We not only manufacture the machine for them,the film as well drawn by our engineer team according to the requirements from the Buyer. 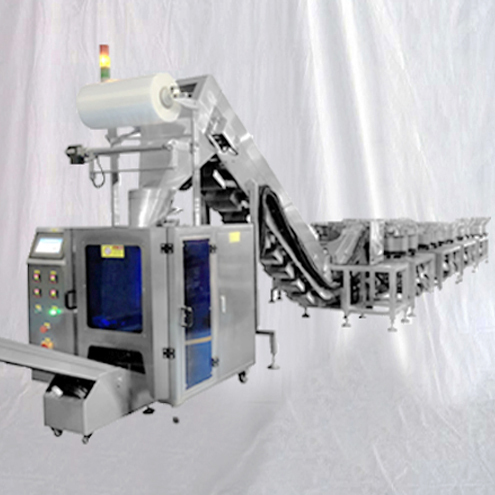 The twin lanes packaging machine packs the liquid or oil or other fluid liquid into the shaped bags which are made of PE/PET/Paper materials film. For a vertical form-fill-seal the film approaches the back of a long hollow conical tube, which is called the forming tube. When the center of the plastic is near the tube, the outer edges of the film form flaps that wrap around the conical forming tube. The film is pulled downward around the outside of the tube and a vertical heat-sealing bar clamps onto the edges of the film to create the "fin Seal", bonding the film by melting the seam edges together. 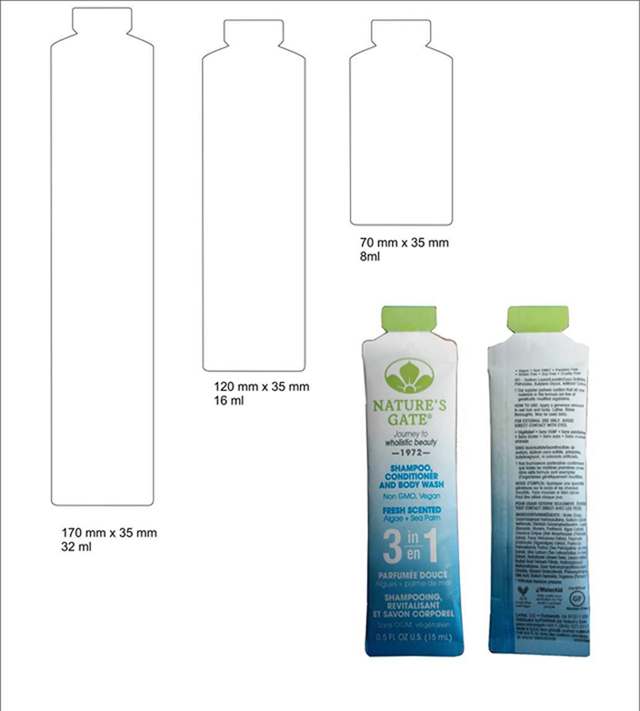 To start the bagging process, a horizontal sealing bar creates the "Bottom Seal" by clamping across the bottom edge of the tube, bonding the film together, and cutting off any film below. This sealing bar can be on a fixed height, which is called an intermittent sealing process. 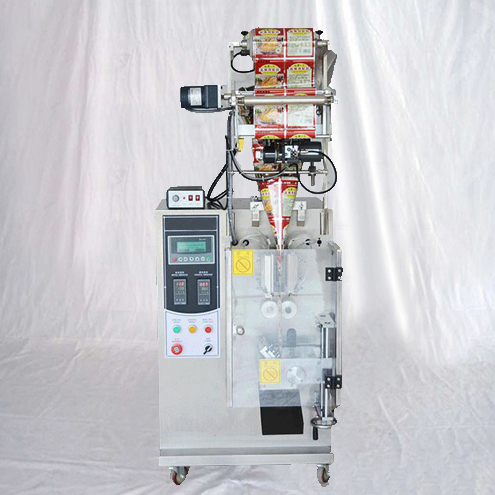 Faster systems include a sealing bar that moves down with the bag while sealing. This is called a continuous process. 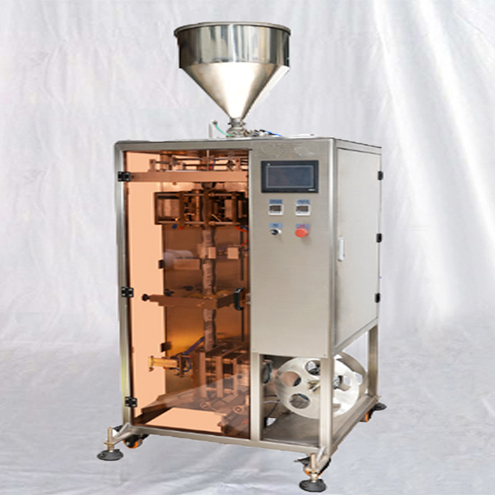 The product is either pre-measured by a multi-head weighing system or the sealed tube end is then lowered onto a precision weighing table and the product to be bagged is dispensed through the long conical tube in the center of the bag. 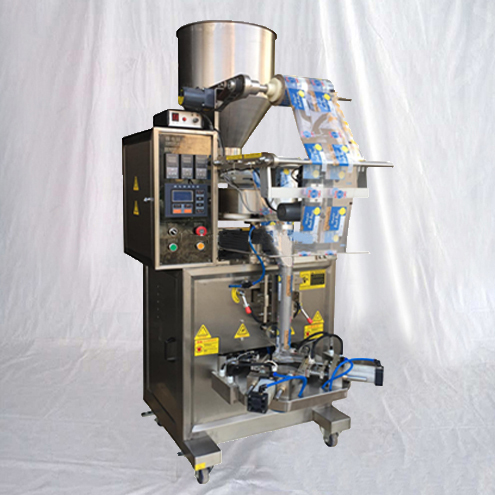 When the gross weight of the product-filled bag is reached, filling stops, and the horizontal sealing bar seals the top of the bag, simultaneously forming the bottom of the next bag above. This bag is then cut off from the tube and is now a sealed package, ready to advance onward into the product boxing and shipping processes. During the final sealing process, the bag may be filled with air from a blower or from an inert gas supply such as nitrogen. Inflating the bag helps reduce the crushing of fragile products such as potato chips, while inflating with inert gas helps drive out oxygen and retards the growth of bacteria that would spoil the product. 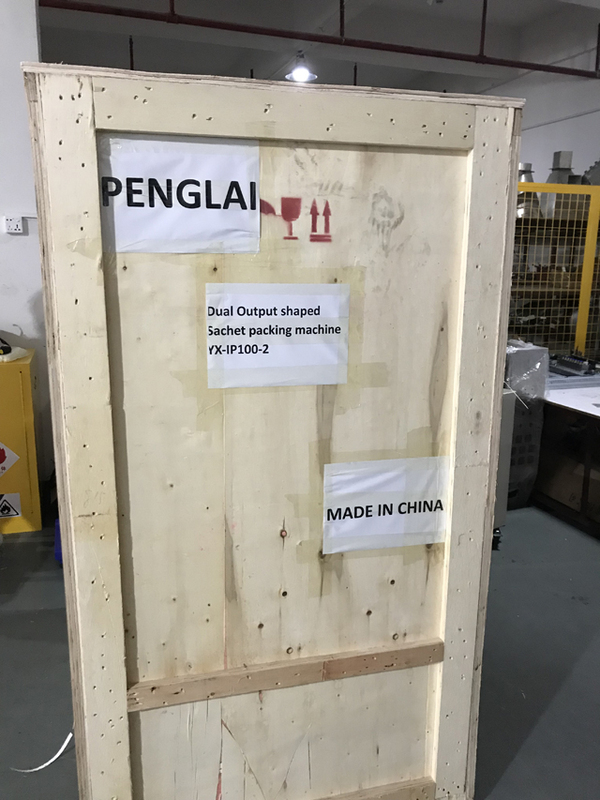 Other product finishes such as hole punching for retail hanging racks will be done concurrently or just after the "Top Seal" is made. 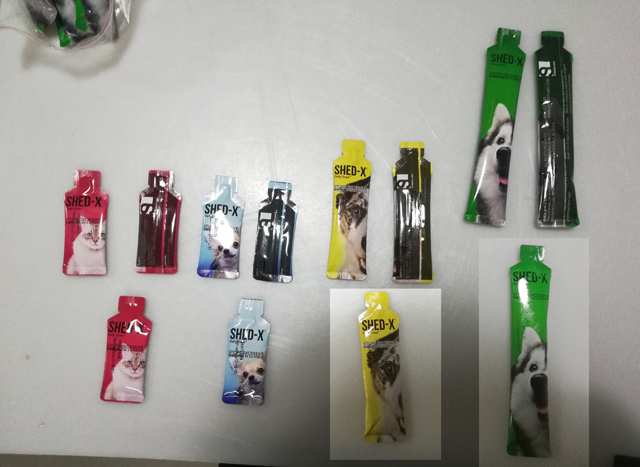 The feeding of material and cutting of the bag/pouch can be determined either by pouch length, or by indexing to an eyespot (photo registration mark), which is detected by a visual sensor. 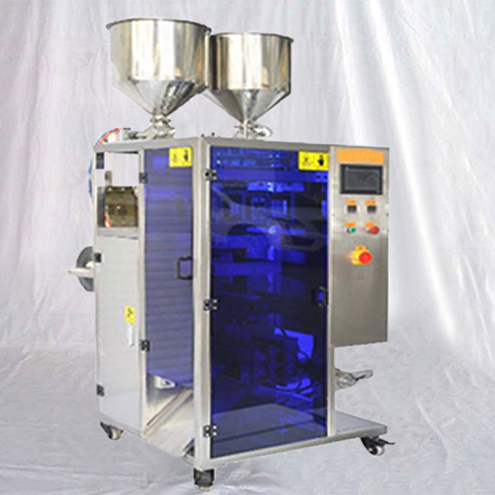 While single web systems are popular for food applications, the dual web four side seal system is often popular for IVD and Medical device products. 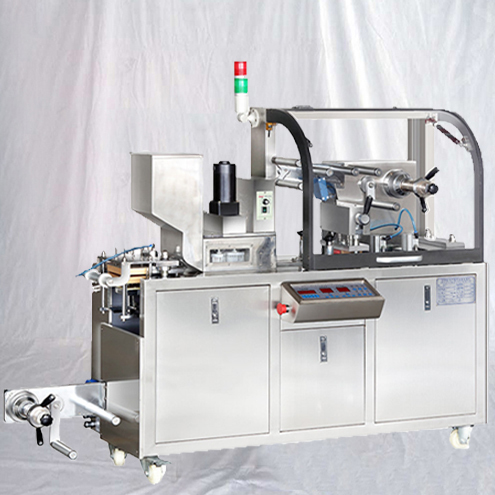 Closely related is the horizontal form-fill-seal machine, which generally uses more floor space than a vertical system. 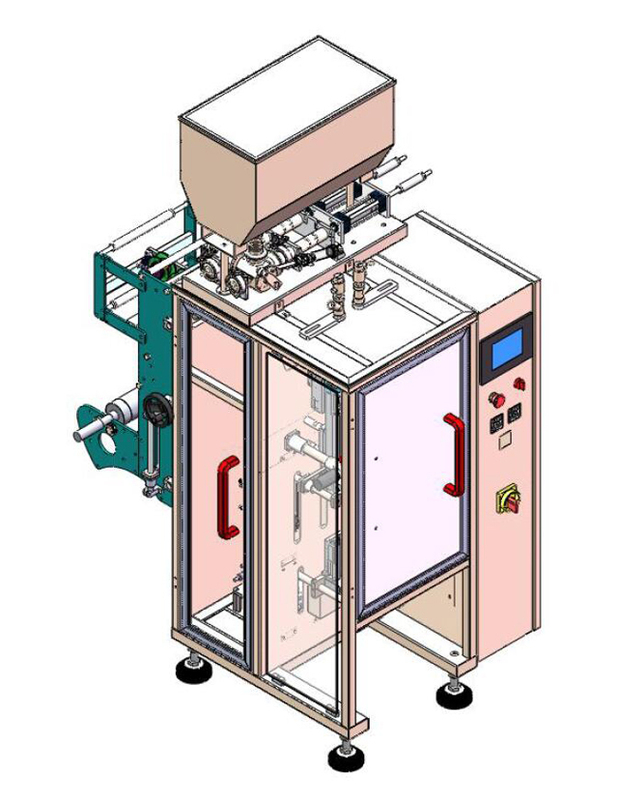 Modern advancements in pouch forming technology have allowed for smaller and smaller Vertical pouch forming systems. Many food filled packages are filled with nitrogen to extend shelf life. Food manufacturers are often looking for ways to improve their geographical reach or otherwise extending the shelf life of their product without the use of chemicals. 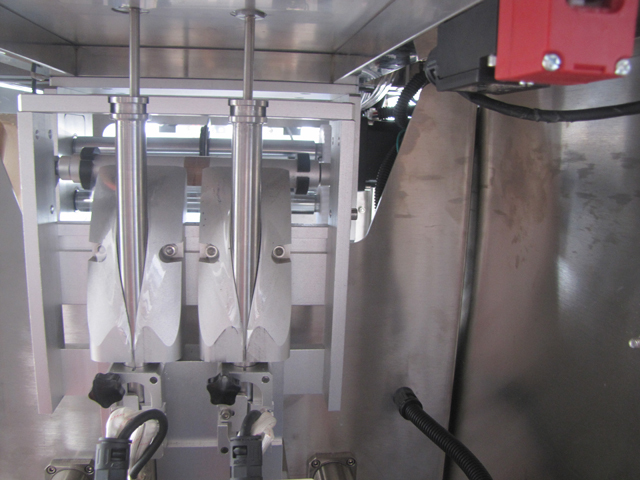 Nitrogen filling is a natural means of extending shelf life. More and more manufacturers are choosing to create and control their own nitrogen supply by using an on demand nitrogen generators. 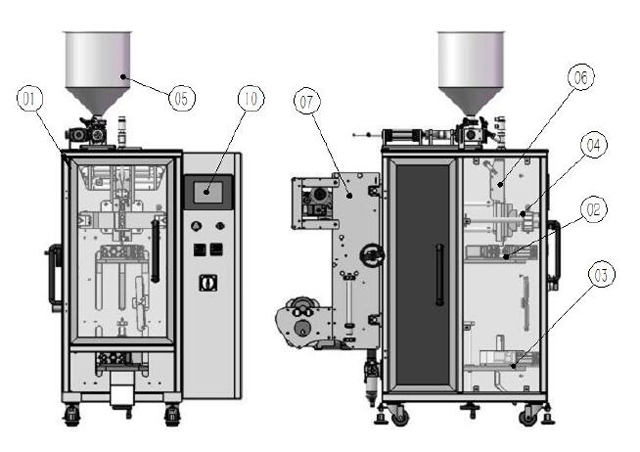 1.Automatic packing for all kinds of liquid,powder,granule materials. 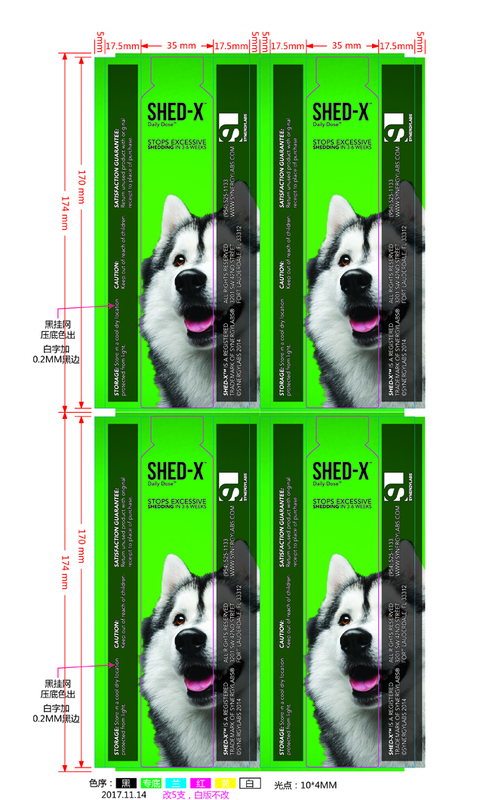 2.Show packaging speed and number of packages,adjustable packing speed. 4.We stock all spare parts for this machine. (1)Make sure that the seal fittings are set as shown in Figure (a). 2. Loosen the fastening screws and then reduce the pressure on the fastening. This time the heat sealing device can be moved.Seal the left and right heat sealing devices together. 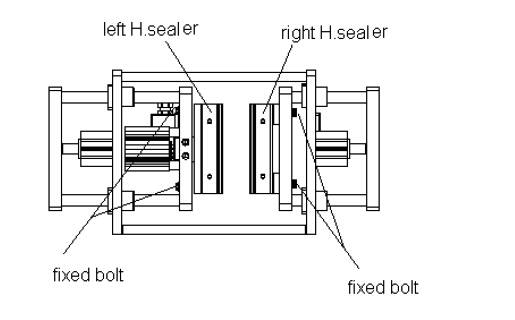 In the left and right sides of the heat sealing device, the two sides of the normal, slow closing the horizontal sealing mechanism, and lock the fastening screws. The most important factors for the adhesion are the adjustments for the temperature and the seal pressure. If both of these adjustments are correct, the locations other than the polyester are separated when it is peeled. (2) Refer to the section “3.2 temperature controller (PID)” for a description of the temperature setting procedures. 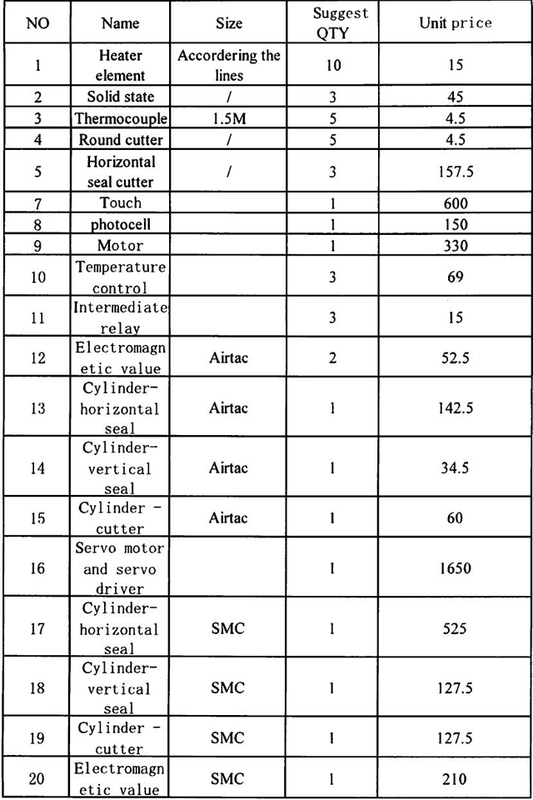 In general, the strength of the adhesion increases if the sealing time and pressure is increased. 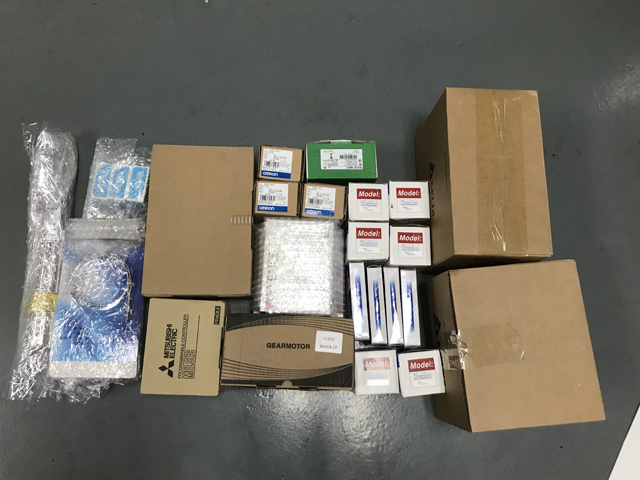 1.Detection of position adjustment 1 photoelectric switch, to ensure that the light electric eye detection point to the heat sealing device for transverse sealing intermediate integer bag length, i.e. optical sighting electric eye color, then the heat sealing device is sealed in the sealing mark color. 2. Lens of the photocell is in a distance of about 3mm to the packing film. When the film is being fed the photo spot must detect a registration mark. After the photocell has detected a registration mark, the photocell’s function indicator should show a change such that if the checked mark is in light color, the indicator will not turn on. The indicator only turns on when a dark color is checked up. Otherwise, the sensitivity knob has to be readjusted. If the base color is in a little difference with the registration mark, the sensitivity of the photocell should be readjusted once more in order to avoid erroneous action. 3．Adjustment on the sensitivity: When the packing material has been put in the right place, slide the film through the film guide plate at the photocell, make the packing material align with the registration mark area, switch the MODE key on the fiber amplifier to SET status, and press ON key, when put the fiber head on the non- registration mark area, then press the OFF key, at last, press the MODE key to return to the original status. At this time, slid the packing material, when light source casts on the non-color-mark area, the red indicator won’t be on; When the light source casts on the non-color-mark area, the red indicator will on, if not, please readjust! q. The power source plug has not connected? *. Forked connection plug in. ♦Although the power source has started, the machine cannot run. q. Power source plug connection reliable? *. Plug head and plug body reliable connection. ♦ Although the power source has started, the machine cannot run. q. The machine emergency gate has opened? *. The machine emergency gate must shut down reliably, if not reliably, it will can start the safety device. q. Has open the emergency switch? *. Raveling emergency switch locking. a. Although has pressed down the stop button, also is unable to stop the machine. q. The machine program makes a mistake. a. Because color code examination is not normal, the machine stops the operation. q. Is color code examination correct? a. Because color code examination not normal, the machine stop the operation. q. Is Photocell compensation establishment appropriate? a. The instruction of temperature controller can’t increase. q. Has the heater electric heating tube separated? q. Do the Thermo-element broke line? q. Has the temperature controller been damaged? q. Has the fuse separated? a The instruction of temperature controller can’t increase..
q. Has the thermo-element loosened? a The instruction of temperature controller can’t increase. q. Has the relay been damaged? a The instruction of temperature controller can’t decrease..
q. Has the thermo-element been damaged? a. delivering paper motor of packing material can’t rotate. q. Has delivering paper motor broken? a. delivering paper motor of packing material can’t rotate..
q. Has close switch been damaged? a delivering paper motor of packing material can’t rotate. q. Has relay on the power panel been damaged? a delivering motor of packing material can’t rotate. q Has this line already been broke contact? 9.1 Refill oil timely to the places where gears mesh, to the oil holes, and to the moving parts. 9.2 Never run the reduction gears without oil. Change the oil after 40 hours of initial run, and then change the oil every 3 months of operation. 9.3 Clean the machine one time at the end of each work-shift. Clear out any residuals in the measuring plates and in the platforms of the machine to avoid any moisture that would affect the next shift of operation. 9.4 Check regularly for loosening of fix screws at every component, to ensure a reliable operation. 9.5 Clean regularly the photo head.